Welcome to our Employment Opportunities page! If you’re looking for an opportunity to be appreciated and involved in your career, your search is complete. We have a great history of providing excellent careers for sharp, energetic people. Top Sales Professionals, earn what you’re worth and join a winning team! Prestige Imports Porsche Audi is Colorado’s #1 Porsche and Audi dealer and we are immediately hiring Luxury Automotive Sales Professionals. When you join our organization, you will have all the tools necessary to support your efforts in a lucrative career. Porsche – J.D. Power has voted Porsche the most appealing brand for 12 years. Audi – 89 consecutive months of uninterrupted growth AND more 2018 IIHS Top Safety Picks than any other luxury manufacturer in its class! Additionally, we stock a broad selection of Certified Pre-Owned Porsche and Audi vehicles as well as a wide assortment of other luxury and performance pre-owned vehicles. At Prestige Imports, you will be representing quality products you’ll feel proud to stand behind. Each brand, by itself, is a tremendous opportunity for any competent and driven salesperson to build and grow a lucrative career in sales and in the auto industry. A hunter’s mentality – someone who will prepare endlessly and take full advantage of extensive information, contacts, and leads to put themselves in a position to land as many deals as possible. We need the kind of drive that pushes a salesperson to never rest on their laurels and always look for the next big thing. Discipline to follow-up – Consistent follow-up is a key success factor in luxury automotive sales. Intelligence, Personality, and Drive – A mix of these personality traits will ensure that you can get in front of buyers and also close the deal, ultimately creating relationships that pay dividends over time. Experienced automobile sales professionals preferred but will train the right applicant. We are an equal opportunity employer committed to a drug free work environment. Pre-employment drug screening and background check will be conducted. A valid driver’s license and good driving record are required. Please send your resume to salesmanagement@prestigeimports.net to apply. Any applicant called for an interview must bring a copy of their Colorado driving record in order to proceed with the interview process. Prestige Imports, a Luxury Automotive Dealer in the Denver Metro area, is looking to hire a customer service oriented Appointment Setter for the Service Department. The Service Appointment Setter / BDC Representative is responsible for driving traffic to the service department by providing exceptional customer service and scheduling appointments for new and returning customers. This role is a specialized, highly trained and skilled member of the Service Department. The Representative handles inbound service appointment calls, confirms service appointments, performs outbound follow-up calls for service clients, as well as several other types of inbound and outbound calls. The Appointment Setter must possess outstanding communication skills, be cheerful, enthusiastic, and have the ability to speak articulately. Please send your resume to bvavra@prestigeimports.net to apply. 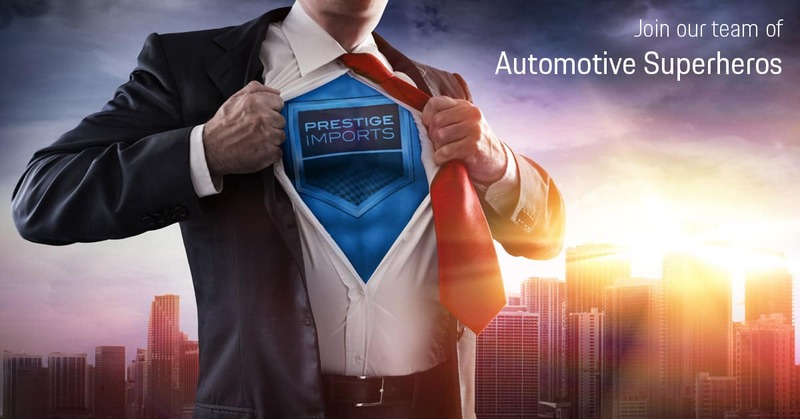 Prestige Imports, the area’s premier Porsche and Audi dealer is in need of a Service Porter. General duties include moving, cleaning, delivering, picking up, dropping off, and organizing the vehicles. Assisting all departments as well as clientele. Washing vehicles for customer delivery. This position has a significant amount of customer interaction, so enthusiasm and professionalism are a must. Full-time employee must have a flexible schedule. Applicants must be able to drive a manual transmission vehicle, must have a clean MVR (Motor Vehicle Record), and must be able to pass a drug and background screen (this includes marijuana.) Any applicant called for an interview must bring a copy of their Colorado driving record in order to proceed with the interview process. Benefits include medical/dental/401K, paid holidays, and paid vacation. Looking for Full and Part-time employees. Work hours availability for scheduling needs to be from 7:00am to 7:00pm Monday through Friday and 8:30am – 5:00pm on Saturdays. Please send your resume to davestribling@prestigeimports.net to apply. Prestige Imports, the area’s premier Porsche and Audi dealer is in need of a Lot Assistant. General duties include moving, cleaning, delivering, picking-up, dropping-off vehicles, and vehicle/lot organization. This also includes, taking vehicles for emissions testing, assisting sales staff and clientele, prepping vehicles for customer delivery, and checking in new vehicles from transporters or customers. This position has a significant amount of customer interaction, so enthusiasm and professionalism are a must. Please respond to this post with your resume to apply. Full-time employee must have a flexible schedule and able to work Saturdays. Applicants MUST be able to drive a manual transmission vehicle, have a clean MVR (Motor Vehicle Record), and be able to pass a drug and background screen (this includes marijuana). Any applicant called for an interview must bring a copy of their Colorado driving record in order to proceed with the interview process. Prestige is looking for Full and Part-time employees. Please send your resume to salesmanagement@prestigeimports.net to apply.